Today Miami-Dade County Mayor Carlos A. Gimenez, Miami Mayor Tomás P. Regalado, and Miami Beach Mayor Philip Levine, joined by The Rockefeller Foundation Chief Operating Officer Peter Madonia and Amy Armstrong, Director of City Relationships at 100 Resilient Cities, celebrated their region’s selection to the 100 Resilient Cities (100RC) global network. 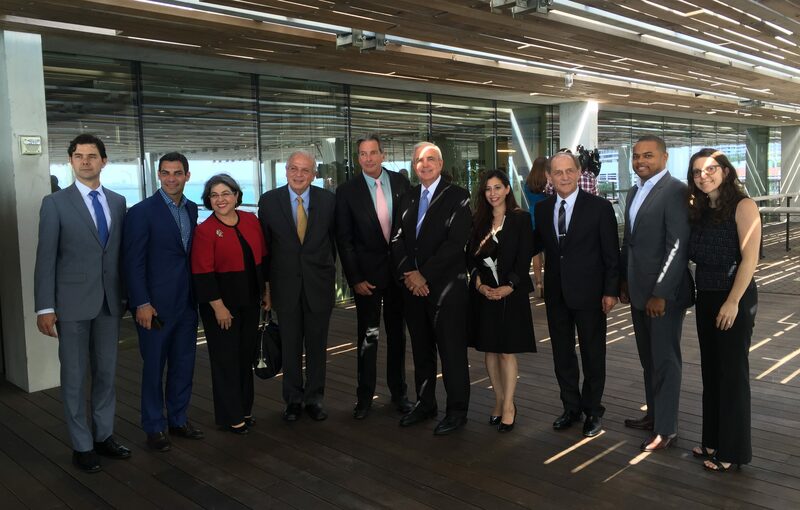 The mayors announced the joint selection from the Perez Art Museum Miami, noting that by entering the 100RC network, the Miami region will be better equipped to solve local challenges around transportation, economic equality, sea level rise, aging infrastructure, and more. 100RC is a $164 million effort founded by The Rockefeller Foundation in 2013, focused on helping cities around the world build resilience to the social, economic, and physical challenges of the 21st century. As members of the 100RC Network, Miami-Dade County, the City of Miami and the City of Miami Beach will receive funding and support for Chief Resilience Officers (CROs) – innovative new positions within local government. A CRO to be appointed at the City of Miami will partner with Miami-Dade County CRO James Murley and Miami Beach CRO Susanne Torriente and will work directly with county and city leaders to develop a joint Resilience Strategy. The county and cities will receive technical support through 100RC to develop a Resilience Strategy that reflects the region’s collective needs and its capacity to address them, along with the support and services to implement that vision. This strategy will involve outreach to and coordination with the other 32 municipalities in the region. The cities will also gain access to 100RC Platform Partners in the private, public, academic, and nonprofit sectors. Partners offer tools and services valued at over $200 million – at no direct cost to the region – in areas such as innovative finance, technology, infrastructure, land use, and community and social resilience. Greater Miami and the Beaches was chosen from more than 325 applicants on the basis of their willingness, ability, and need to become resilient. The application process showed each city’s unique vision for resilience, a long-term commitment to building resilience in a way that connects silos of government and sectors of society, and specific attention to the needs of poor and vulnerable citizens. Applicant cities also demonstrated the willingness to be leaders in urban resilience, sharing learning experiences and becoming a model for other cities across the globe. The growing momentum for resilience-building worldwide includes the more than 20 cities that have taken 100RC’s 10% Resilience Pledge, agreeing to dedicate 10% of city budgets – representing more than $5 billion (USD) – to resilience initiatives. Additionally, communities like New York City, New Orleans, and Norfolk, VA, have seen hundreds of millions of dollars steered toward their respective efforts to build resilience through the National Disaster Resilience Competition. Finally, communities outside the 100RC network – from North Dakota to Sri Lanka – have created and filled their own CRO positions. “The City of Miami Beach, in partnership with Miami-Dade County and the City of Miami, is proud to be recognized as one of 100 Resilient Cities, powered by The Rockefeller Foundation. Together, we are writing the textbook for addressing sea-level rise, reducing our risks, and creating a vibrant and resilient city of tomorrow,” said Susanne M. Torriente, Miami Beach Chief Resilience Officer and Assistant City Manager. “Our creative and collective efforts today are the foundation for the future of Greater Miami and the Beaches. Member cities were selected upon the recommendation of distinguished judges from around the world, including: A. Eugene Kohn, Chairman of Kohn Pedersen Fox Associates, Acha Leke, Director at McKinsey & Co Africa, Co-Founder of African Leadership Network, Ann Fudge, Vice-Chair and Senior Independent Director of Unilever, Charlotte Petri Gornitzka, Director-General of Swedish International Development Cooperation (SIDA), Dan Doctoroff, CEO of Sidewalk Labs, Dr. Judith Rodin, President of the Rockefeller Foundation, Kai-Uwe Bergmann, Partner at the Bjarke Ingels Group,Michael Kocher, General Manager at Aga Khan Foundation, Nachiket Mor, Former Director and Current Board Member, Reserve Bank of India and Senior Advisor to the Bill & Melinda Gates Foundation, and Nena Stoiljkovic, Vice President, Global Partnerships at the IFC.